We Cheated on Our Library and So Should You! 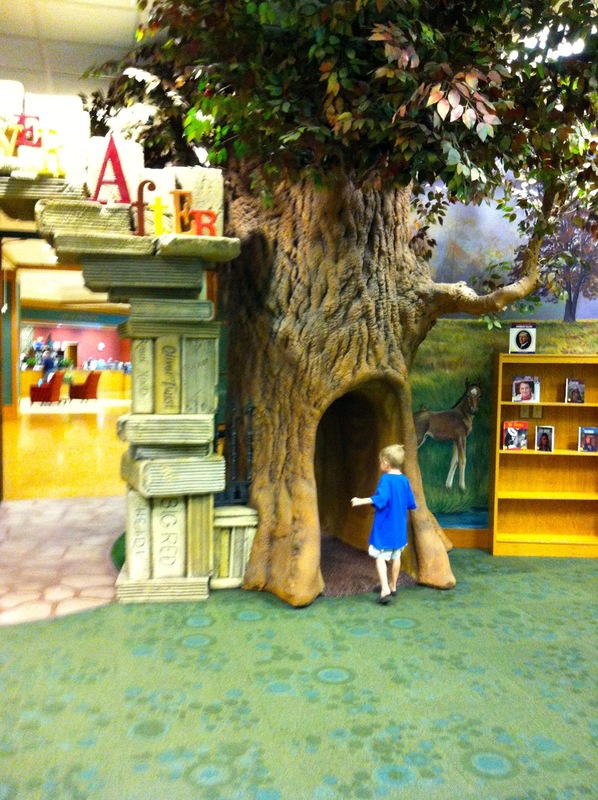 Want to know one of the best things about libraries (besides being filled with books)? They're free, silly! And they're everywhere. So why not take your child on a trip? Go visit a new library! I don't know why my son and I hadn't done this before. I had been thinking about checking out the collection of a library in a wealthy, nearby town with the plan of perhaps paying the annual non-resident fee for a library card. So we drove about 30 minutes up there and checked out their preschool story time too. 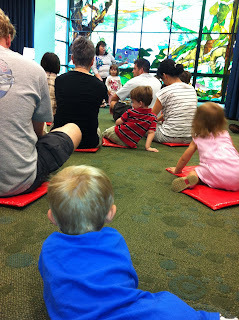 Honestly, I think the preschool story time at our own local library is better, but something new was fun! 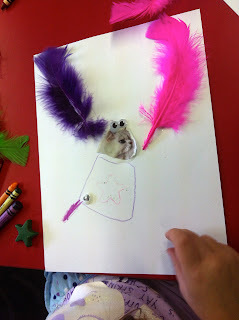 We sang a lot of songs, read one story, and then made a craft. The library we visited was decorated much more elaborately than either of our own local libraries. 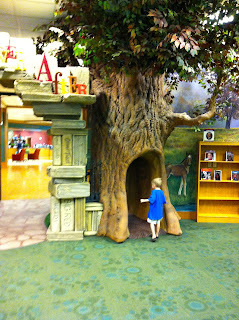 There was an enticing entrance to the children's room, and then lots of neat forest elements that created a magical atmosphere in the entire area. 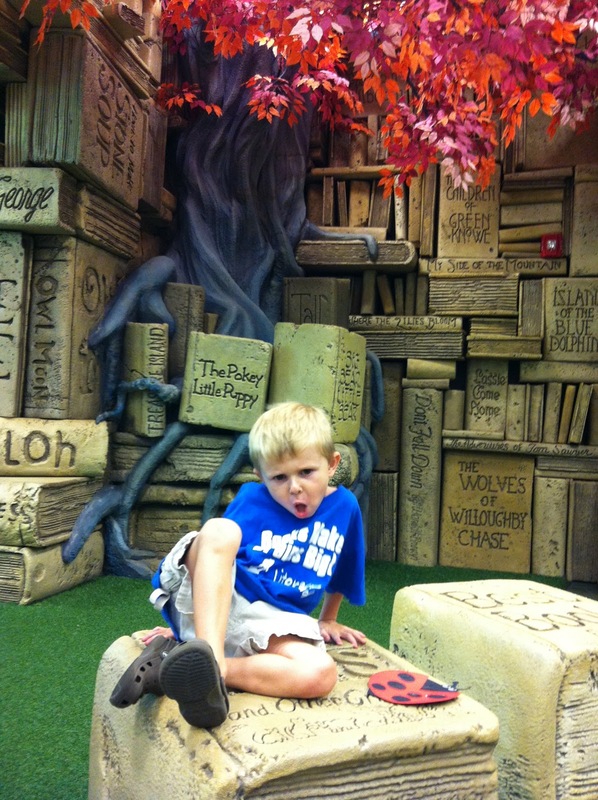 My son was totally enchanted, and asked me to take bunches of photos of him. "Take one of me here, Mommy. Now take one of me here!" 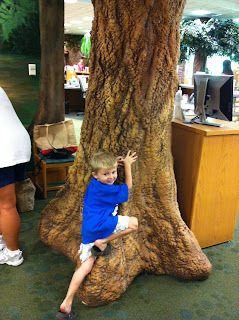 I tried to browse the books, but he kept running from one feature to another, calling me over for more photos. I didn't end up getting a library card for several reasons, the main one being that the collection didn't impress me enough to make me feel it was worth the money (They had no Lunch Lady books in their collection! What?). - Visit the website of neighboring libraries. Have your child look with you and compare photos and features of the various libraries and let your child decide which one to visit first. - Make a "library passport" where you create a simple book with a page for each neighboring library you wish to visit. Then stamp the pages as you visit each one in your book. You could include photos too! - Make a library wish list, including features that you like a library to have, programs you enjoy going to, kinds of books you might want to check out, etc. Look for those things when you visit a neighboring library and compare your checklists later to see which neighboring library is the most appealing to your tastes! Did any offer things that surprised you? - Make a note of all your favorite features of neighboring libraries, maybe take photos, and then encourage your child design their dream library. 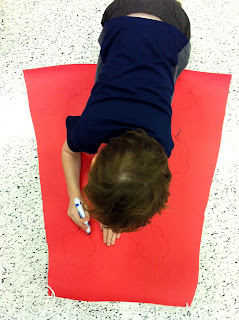 - Print out a library scavenger hunt (Imagination Soup has a great one that my children really enjoyed). Take the scavenger hunt to several neighboring libraries and see what you can find! - Be sure to note the various offerings of neighboring libraries. Remember that you can visit story times, shows, and exhibits for free. In addition to the library visit shown in my photos here, I have also taken my children to another nearby library district that performs elaborate marionette shows regularly. It's often worth the drive for a free show and sometimes a special craft to take home with you! - Check out branch libraries in your own district. We have several libraries that are within our district and have their own unique charms and offerings. And of course, at a branch library you get the added bonus of being able to check out books! - Be explorers! Think of visit as a new adventure! 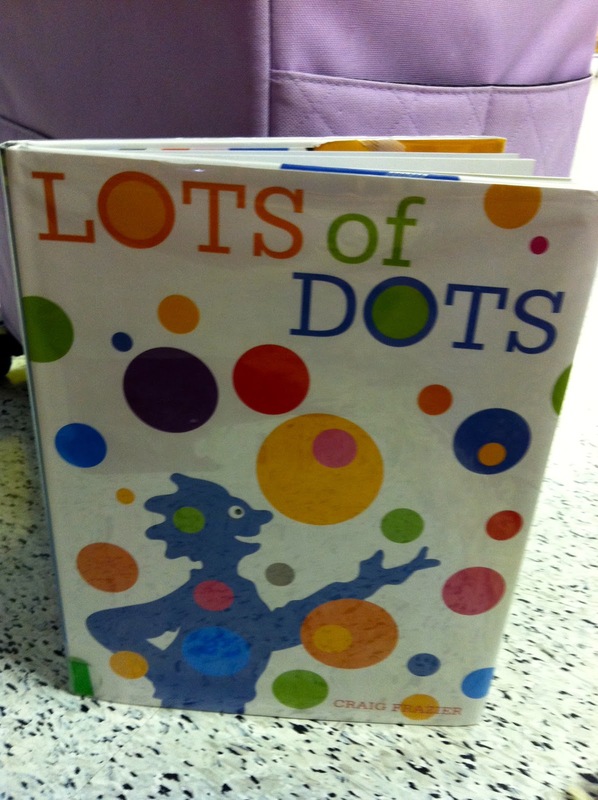 Make a game out of who can find the most unusual, or interesting book in the stacks! Perhaps your child has been interested in a particular subject, see what new and interesting books you can find on that topic. - If you fall in love with a particular library, consider paying the annual fee for a library card. If their collection is more extensive than the collection at your own local library, a $50 annual fee can be a lot cheaper than buying all those books you want to read off Amazon! Just don't forget to return them on time! - Looking for a fun time-filler on your next vacation? Look up the local library in the area you're visiting and see if there's a story time or interesting program that fits your schedule. 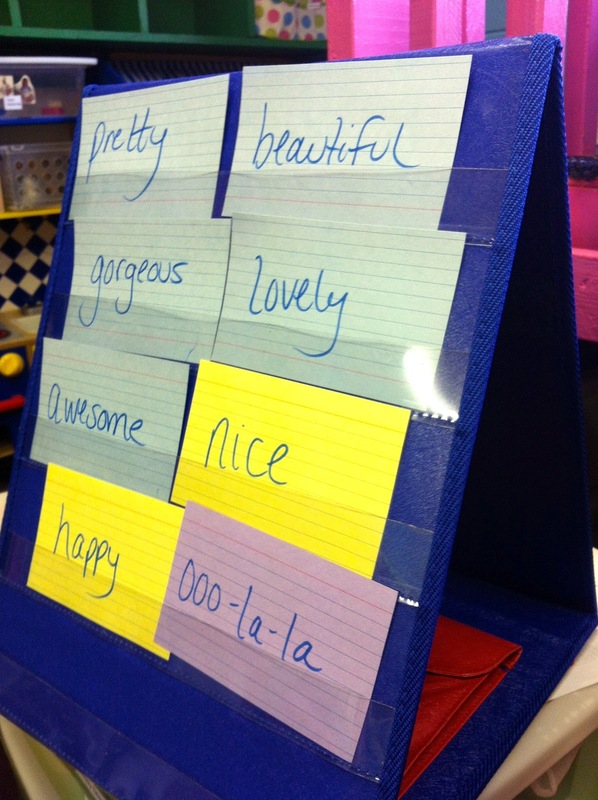 Perfect for encouraging young readers and reminding them that reading is fun! Even vacation-fun! You could keep track on a map of all the places you have visited libraries on your travels! 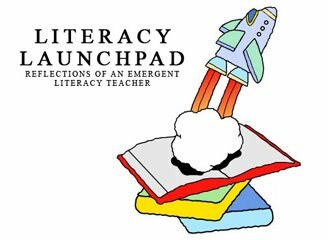 A short list of ideas for encouraging literacy, from my family to yours. 1. Give your pre-reader some wordless (or almost wordless) books and ask them if they'll read it to you. Mine can't get enough of this, and thinks it's great fun. 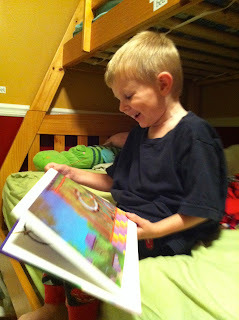 He sat down on the couch with a stack of books yesterday while his older siblings were doing homework, and "read them. I asked him to take the recycling out and he told me, "Not yet, Mom, I'm right in the middle of my book!" 2. Let your big kids read to your little kids. A win-win-win! 3. Keep your writing center stocked and available. You never know when the writing bug will bite! My little guy likes to have his in bedroom. He lovingly refers to it as his "office." 4. Be willing to drop what you're doing and read to your little ones when the urge strikes them. I know it's not always possible, so remember tip #2! 5. Turn regular toys into literacy-learning tools. This week we made alphabet letters out of Legos. 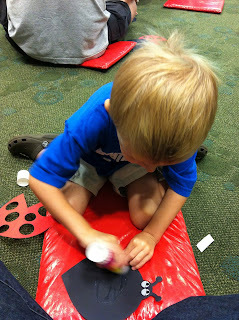 It kept my little guy busy for quite a while on and off all week. I love to see a child hear a story, and then take some inspiration from it and go crazy with their own creativity! That has been happening at Literacy Launchpad all month! Hooray! Literature-Inspired Creativity has been our theme this August. I was pleasantly surprised to see how well my students were engaged in this unit. They loved every bit of it, and showed amazing creativity. I was especially impressed with my youngest students; they usually don't say a whole lot, but I saw their participation increase this month. Everybody had original ideas and tons of enthusiasm. It made me really sad to see this unit end. 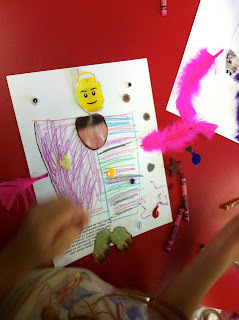 Each week we read a unique story, and then took that special element and let it be our inspiration for a fun project. Our first week it was creating a picture by incorporating "Lots of Dots!" 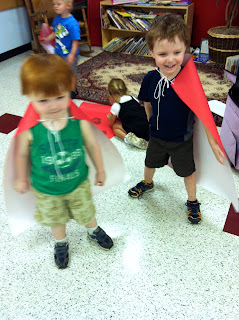 Week two we read Traction Man Is Here and then designed capes for our own action hero identity. We wrapped things up with Call Me Gorgeous and collaged together our own creatures, with our own special names for them! Check out the photos from our month of creativity below. I'll try to answer any questions in the comments if you have them! Don't Stop Reading To Your Kids! 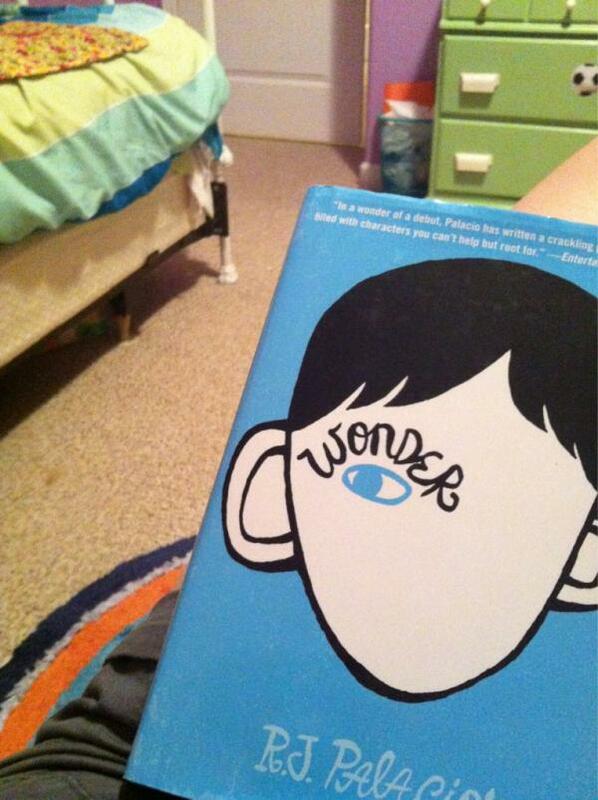 So, at what age do you stop reading aloud to a child? I am a parent of two older, ELL children. My daughter is almost 12, and my son is 8. Neither can read much beyond a first grade level right now. So reading aloud to them at bedtime is something we always do. I think I take for granted that all parents read aloud to their children, regardless of their age and abilities. But that's not the case at all, is it? When children begin reading independently, or sometimes even before that, we assume they have outgrown the need to be read aloud to. But we're wrong. The read-aloud benefits for a child continue even as they get into upper elementary, middle school, and beyond. A parent typically has a higher reading level than their child, so even after your child is reading on their own, by reading to them, you are exposing them richer and more advanced vocabulary. They can take in that rich vocab by listening to a story, even if it's beyond their reading level. Reading aloud also gives parents of older kids the opportunity to introduce to their children new authors, encourage the trial of a new genre, and a general broadening of their horizons. You might be surprised at how open your child is to your books suggestions, if they sense that you are genuinely taking their interests and tastes into account with your suggestions. And perhaps they might broaden your horizons with their book suggestions. As children advance into their teens, reading aloud to them allows you to encourage reading by sharing interesting things with them that you have read. Maybe it doesn't have to be bedtime reading. It could be a bit of an interesting newspaper or magazine article, a funny passage from a book your reading on your own, or a review of a book or a movie. Ending the read-aloud tradition might seem to a child like the end of you caring whether or not they read. It can send the message that reading just isn't important anymore, that you read with them only because it's necessary and not because it's enjoyable. 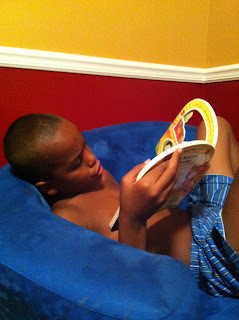 But continuing the read-loud as your child grows means continuing the bonding. Sharing a book together is something intimate and special. It opens doors for wonderful discussions. It's a shared experience that will live on forever in the memory and the heart of your child... and you! What are you reading aloud with your older child?